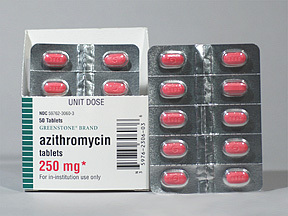 Azithromycin is used to treat severe bacterial infections. Azithromycin is given on limited prescriptions and is not intended for long-term use. Azithromycin is a macrolide antibiotic used to fight bacterial infections within the body. This medication is not intended to be taken for long periods of time, so discuss how long you are to continue your treatment with your doctor before starting your prescription. Infections caused by viruses including the flu or a cold will not be affected by azithromycin. Azithromycin may be sold under the names Azithromycin 3 day dose pack, Azithromycin 5 day dose pack, Zithromax Z-Pak, Zithromax, Zithromax TRI-PAK, Zmax and Zithromax IV. These drugs can be used to battle bacterial infections in the skin, ear, or respiratory system. Certain bacteria-based sexually transmitted diseases, Lyme disease or heart infections may also be treated with azithromycin. Your symptoms may improve before you finish your prescription, but you should continue to take your dose for the time recommended by your doctor. Any medication you have not used after 10 days should be thrown away. It is very important to take your doses consistently when you start an azithromycin regimen. Skipping doses can result in the bacteria becoming resistant to the medication, making it difficult to cure the infection. Most forms of azithromycin can be taken with or without food, but the oral suspension form must be taken 1 hour before or 2 hours after a meal. An oral suspension formula must be mixed with 2 ounces of water and consumed immediately. You may need to swirl a bit of extra water in the glass after consuming your dose to ensure that you have gotten a full dose. Tablets should be taken with a full glass of water. You should take any missed doses as soon as you remember, unless it is within 1 hour of the time you need to take your next dose. Never double up doses of azithromycin. The dosage for azithromycin will depend on how long your doctor expects you to take your medication. Azithromycin is commonly prescribed in 100mg/5 mL or 200mg/5mL doses. The recommended dose for adults is 1000-120- mg of the drug divided weekly. This typically means you will take 1 pack per day. Talk with your doctor about how many days you are meant to take your prescription, as some infections will require a shorter period of treatment. The minimum effective dose of azithromycin is 600 mg, which is typically combined with other drugs including ethambutol. The maximum dose is usually around 1000 mg, and will be divided accordingly in your prescription. Do not take more than 1 packet or tablet at any given time. Some STDs will be treated with 2000 mg doses per day. A dose for a child will depend on their weight. Typically, children will be given 5 mg to 20 mg for every kilogram of body weight. These doses are administered for 3-5 days, while adults may take their dose up for up to 10 days for severe infection. Those who have suffered from jaundice or other liver problems may not be able to take azithromycin due to the heavy impact the medication has on these organs. Talk with your doctor about whether or not it is safe to continue with this prescription if you have a history of liver issues. Side effects for azithromycin occur in a very small portion of the population. The most common side effect for this medication is diarrhea or loose stools, which occurs in up to 7 percent of users. A similar percentage of users exhibit vomiting while on azithromycin. Up to 5 percent of users suffer from nausea, 3 percent report abdominal or stomach pain, 2 percent report unexplained rash and 1 percent report headaches while taking this prescription. In most cases these side effects are not a sign of a serious complication, but you should report any side effects to your doctor to ensure that you can continue to take your medication as directed. If you develop diarrhea that is bloody or watery while on azithromycin this could be a sign that you have developed a new infection. Inform your doctor right away and stop taking your prescription if this occurs. You should not attempt to use any type of anti-diarrhea medication to stop these symptoms unless your doctor specifically tells you to do so. Those who experience yellowing of the skin or eyes, irregular heartbeat, wheezing, hives, abnormal swelling, itching or peeling skin may be experiencing a severe reaction to azithromycin. Stop taking your medication and contact your doctor right away if you begin to exhibit these symptoms. If any of your side effects are making it difficult for you to breathe or make you feel as though you will faint, contact emergency medical services right away. Very rare side effects, occurring in less than 1 percent of users, include heartburn, constipation, intestinal infections, vaginal yeast infections, dehydration, low blood pressure, kidney failure, ringing in the ears, unusual burning or tingling sensations or irritation of the liver. If you are prone to any of these conditions, inform your doctor before you start taking azithromycin so they can determine whether or not you are at risk for developing a more serious condition. If you begin to develop any of these conditions, seek medical assistance as soon as possible. Azithromycin is rated in category B for pregnancy. This means it is not known to cause harm to an unborn baby, but no studies have been performed on human subjects as of yet. Azithromycin does pass into the breast milk when you are nursing, so talk with your doctor about any potential risk for either of these situations before you continue your dosage. You should not give azithromycin to children under 6 months old as their immune system may not yet be developed to the point where they could handle these strong antibiotics. Some antacids may make it difficult for your body to absorb azithromycin properly, so avoid taking any antacids 2 hours before you are to take your prescription. Other drugs known to interact with azithromycin include digoxin, carbamazepine, cyclosporine, pimozide, phenytoin, triazolam, theophylline, warfarin, alprazolam, diazepam, midazolam, other antibiotics, calcium channel blockers, cholesterol medications, ergot medications or HIV medications. Inform your doctor regarding any medications, supplements or over-the-counter products you might be taking before you begin to take azithromycin so your doctor can determine whether or not you are at risk. Those who have had allergic reactions to medications such as erythromycin, clarithromycin, troleandomycin or telithromycin should not take azithromycin because they will be at risk for a similar reaction. Patients taking azithromycin are at a higher risk to developing sunburn. Avoid direct sunlight or tanning beds and wear sunscreen while outdoors until you are finished with your prescription.